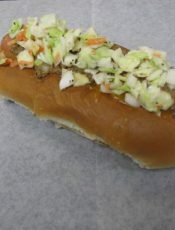 The Half Shell dog is served on a soft, steamed bun and topped with cheese, homemade chili and slaw. 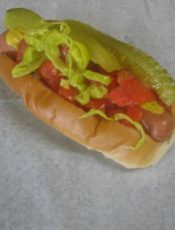 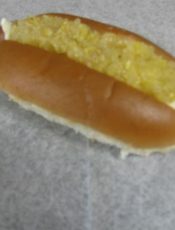 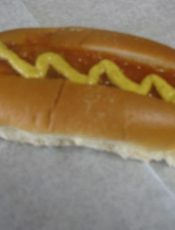 Our 100% All Meat Hot Dogs are prepared to ensure the best quality and taste anywhere. 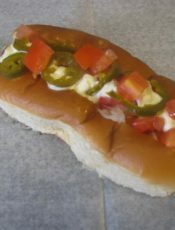 These dogs are served on a soft, steamed bun and topped with the highest quality toppings such as melted Cheese, Jalapeño Peppers, Tomatoes, and Mayo. 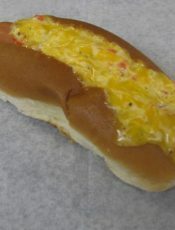 Our 100% All Meat Hot Dogs are prepared to ensure the best quality and taste anywhere. 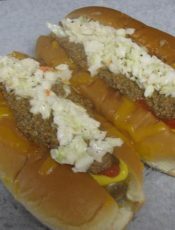 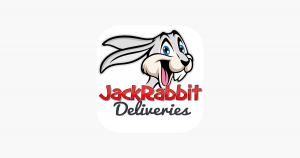 These dogs are served on a soft, steamed bun and topped with the highest quality toppings such as onions, mustard, pickle, hot pepper, tomato and celery salt.